This week I posted an image of two books I had laid out for ABCNJ. 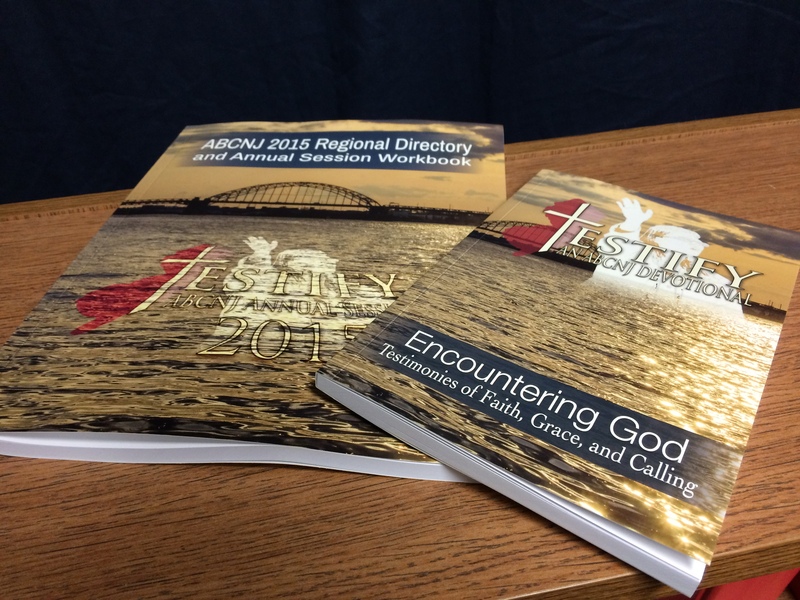 One is our 2015 Regional Directory, the other is a devotional based on various testimonies from the region. Both represent my first attempts at using InDesign for large-scale page layout work, and I do have to say I’m impressed with the results 1. The photo is entitled, The Physical Manifestations of my July and August. As you might guess, the bulk of the work for these two books was completed during these two months. Thankfully, I had the amazing Literary Lindsey to handle the editing for the devotional 2. In reality, however, the books are a small portion of a project which has spanned from the end of 2014 and through this current year. 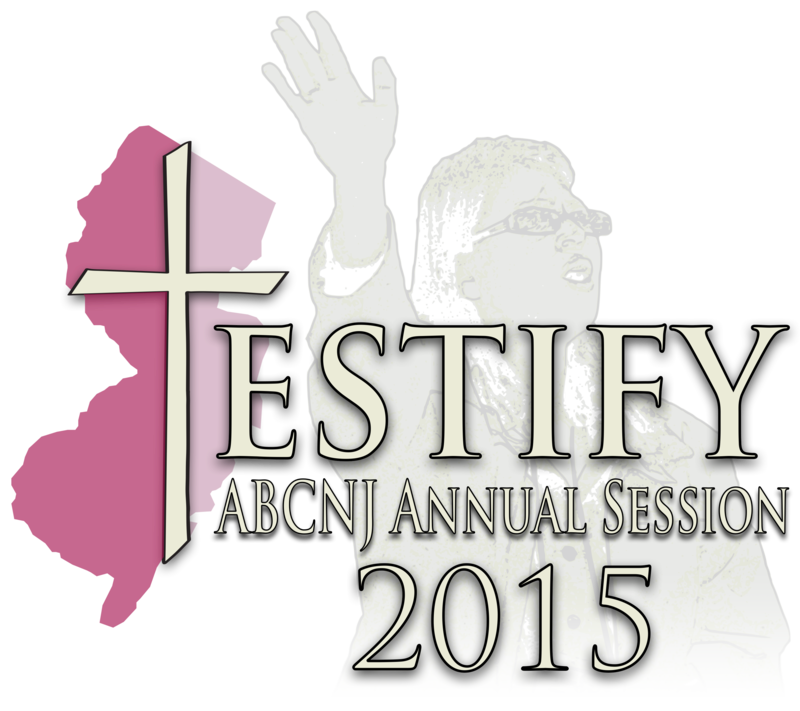 ABCNJ’s Annual Session is the event for The American Baptist Churches of New Jersey, where we get to celebrate what God’s been up to. Rounding up Baptists to do anything is akin to herding cats 3, so getting between six and seven hundred together each year is quite a feat. The planning process begins in the Fall, almost immediately after the dust settles on the previous year’s event. It starts when our illustrious Regional Pastor unveils the theme for the upcoming year. There are often a few brainstorming sessions about avenues the theme could take, typically with the regional ministry staff, and then I go into my corner 4 and begin to map out rough ideas through which we can brand the event. Below is the logo for 2015 Annual Session. I love this stage of preparation because it forces me to extend my Photoshop skills and imagine ways the theme can invite people to join the celebration. 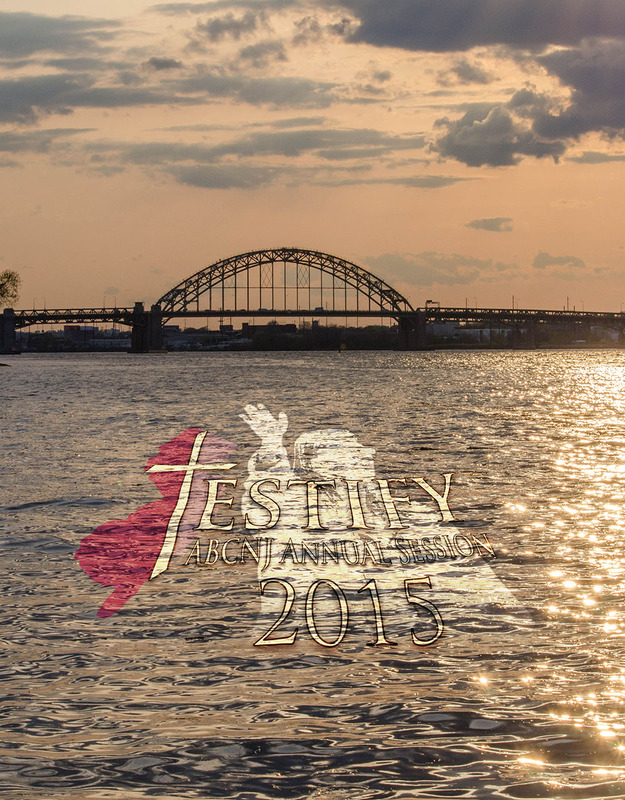 This year I ended up playing with displacement maps for the first time, which allowed me to cause logo to appear as though it was settled on the Delaware River 5. This image became the basis for the Directory cover, and also the large banner which we will hang during the event. Branding typically ends around March, though the tweaks certainly keep coming throughout the following months. As this stage ends we begin to set up ticket costs and prepare the registration process through Eventbrite. Concurrent to this, the Annual Session planning team 6 begins to form the shape of the event. Invitations are sent out to presenters and speakers, and as confirmations come in we plug them into appropriate portions of the schedule. Once the basic shape of the schedule is prepared, and the main participants are confirmed, the media blitz begins. This year ABCNJ has moved to MailChimp as its email platform, which has made sending out missives a great deal more fun 7. Alongside the email barrage, print materials are developed and sent out to our churches, though the volume of this material has declined over the years 8. This campaign grows throughout the Summer as the “early bird” deadline approaches in mid-August. Then pauses and restarts as the Event itself nears it’s arrival. In early June I begin preparing Annual Session’s visuals with the formation of a custom Keynote template. This is some of the most fun I have during the project, as I am let loose to create a visual style which matches the overarching theme of the day, often stretching my Keynote skills in the process 9. This template then lays fallow until late July, when the first version of the podium schedule is released by our region pastor. I then comb though the schedule and add an master slides I may have overlooked in my first draft. From that point I begin to create the media presentations for the day. This is a arduous process. Music and video files have to be obtained, “head shots” have to be obtained for the major presenters, and in-house videos have to be produced. In addition to these tasks, speakers who wish to use the screen during their presentation have to be instructed on the format for their materials 10 as well as how to submit them to the region for inclusion into media schedule. Upon receiving these materials I set them all into a presentation which mirrors the podium schedule. The order of these slides remains in flux until the day before the event 11. Once September arrives print materials for the Annual Session are customized and printed. These include certificates for continuing education, baptism, and special recognitions. Our main print jobs, such as the books I laid out, are sent to a print shop and brought to the office to be included in the “goodie bags” we give out during registration. Also in September, I create special themes and set up the lyrics in OpenLP for the congregational singing. Then the day arrives, and the staff is up early 12. Out in the hotel lobby registration is set up and vendors are directed to their tables. Inside the ball room the projection and sound systems are set up, converting a dining area into a media powerhouse. Music groups perform a sound check and I wrestle with equipment I do not own, trying to make the images on screen match what I have in my computer. The setup process typically ends around 8:15 AM, which is good because Annual Session begins at 8:30! It’s a stressful journey, but is eventually rewarding. What’s more, I’ve only covered the bits with which I’m directly involved. The sheer number of hours the ABCNJ staff puts into registration, communication, site management, travel arrangements, and material organization is staggering. The podium schedule alone represents dozens of hours of writing, rewriting, and adjustment – all done with the knowledge if one person decides to go “off script” the flow of the entire day is going to be thrown off! Next time you go to a large event, make sure to take several glances to the people working behind the scenes, and ponder the weight of the hours they spent working to make the day a success. It’s nothing short of terribly marvelous.